Investment banking research reports aren’t exactly the kinds of things you start reading and can’t put down. J. K. Rowling probably doesn’t worry much about competing with the latest research report on IBM from a major investment bank. That said, oodles of important information about a company can be stuffed into a research report. And knowing how to read research reports has elements of both art and science. Research reports don’t have to follow a specific formula. Analysts at different investment banks have some latitude in determining the look and feel of their reports. But more often than not, research reports follow a certain protocol of what investors expect them to look like. Many of the research reports from major research organizations follow somewhat of a pattern that contain key elements, making them easy for investors to find information they need. Here is a reprint of the first page of a research report from S&P Capital IQ. To be clear, S&P Capital IQ is not an investment bank, but a well-known and independent provider of stock research. What S&P Capital IQ provides is technically independent equity research, not sell-side research, because the company doesn’t do any investment banking. 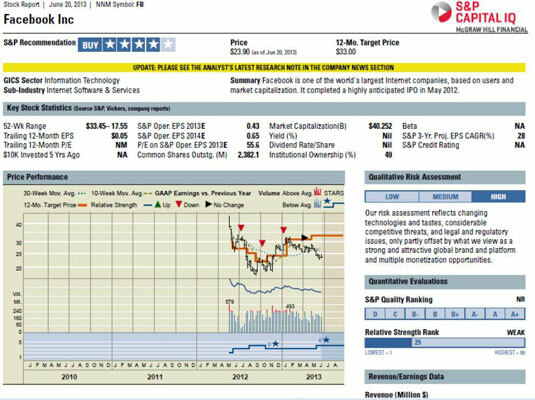 Still the format of S&P Capital IQ’s reports adhere to industry standards and are illustrative for that reason.